You've probably heard of rooibos tea, also known as Red Bush, which is a distinct beverage popular in South Africa. The tea has a high antioxidant content and is completely caffeine free, with a woody-sweet, nutty flavor. The tea comes from the rooibos plant, which is known particularly for its anti-allergy and respiratory benefits. This plant also has natural compounds that encourage healthy skin. Rooibos leaves are dried and used to make tea, though parts of the plant are now used in skin care formulas as well. Scientifically known as Aspalathus linearis, rooibos is a member of the legume family of plants native to South Africa. The story goes that pioneers who moved away from modern-day Cape Town to the north-western inland territory found the native inhabitants of South Africa; namely, the Khoikhoi. These natives shared their knowledge of rooibos herbal tea. The plant actually comes in four main categories: red, ash-colored, black, and red-brown. The red is the most popular, however, for making tea. The plant itself grows up to about 6.5 feet, with needle-like leaves about ½ inch long. Yellow flowers appear in spring to early summer, and are arranged in dense groups at the tips of the branches. Like regular tea, rooibos tea contains flavonoids which act as antioxidants, similar to the flavonoids in green tea. In fact, one laboratory study found that aspalathin, a flavonoid in rooibos, is even more effective at scavenging damaging free radicals than epigallocatechin gallate (EGCG) from green tea. An animal study also showed that rats given rooibos tea had higher superoxide dismutase (SOD—a protein that neutralizes free radicals) levels in their blood than those not fed the tea, and they also had less DNA damage. The study also indicated that rooibos tea had an anti-inflammatory effect. Other studies have shown rooibos to have potential cardiovascular benefits, in helping to reduce high blood pressure. Animal studies have also indicated that rooibos tea suppresses the increase in fasting blood glucose levels, and may stimulate glucose update in muscle tissues and insulin secretion from the pancreas. Rooibos tea has also been used historically to treat respiratory disorders, with animal studies showing that the tea is both a bronchodilator and an antispasmodic. Additional animal studies have shown rooibos to have potential in helping to prevent and treat liver diseases, and to prevent oxidation of brain tissues that lead to aging. Because of its high flavonoid content, rooibos is a powerful anti-aging ingredient for skin care formulas. Since much of skin aging is caused by environmental stressors, rooibos' abilities help to protect skin and maintain a more youthful look. Rooibos is also known to be helpful for sensitive skin. Rooibos is a source of vitamin D and zinc, and has been shown to be protective. Finally, rooibos, because of its soothing properties, is known to not cause reactions on the skin. I'm sold on the benefits of rooibos, so I've included in the following products. If you try any of these, let me know what you think! Did you know rooibos had so many benefits for the skin? Have you used the tea for other health benefits? Please share any tips you may have. Photo courtesy seekoh via Flickr.com. Snijman PW, et al., “Antioxidant activity of the dihydrochalcones Aspalathin and Nothofagin and their corresponding flavones in relation to other Rooibos (Aspalathus linearis) Flavonoids, Epigallocatechin Gallate, and Trolox,” J. Agric Food Chem. 2009 Aug 12; 57 (15):6678-84, http://www.hubmed.org/display.cgi?uids=19722573. Baba H., et al., “Studies of anti-inflammatory effects of Rooibos tea in rats,” Pediatr Int. 2009 Oct; 51(5): 700-4, http://www.hubmed.org/display.cgi?uids=19419525. Kawano A, et al., “Hypoglycemic effect of aspalathin, a rooibos tea component from Aspalathus linearis, in type 2 diabetic model db/db mice,” Phytomedicine 2009 May; 16(5): 437-43, http://www.hubmed.org/display.cgi?uids=19188054. Khan AU, et al., “Selective bronchodilatory effect of Rooibos tea (Aspalathus linearis) and its flavonoid, chrysoeriol,” Eur J Nutr 2006 Dec; 45(8): 463-9, http://www.hubmed.org/display.cgi?uids=17080260. Gilani AH, et al., “Antispasmodic effects of Rooibos tea (Aspalathus linearis) is mediated predominantly through K+ -channel activation,” Basic Clin Pharmacol Toxicol. 2006 Nov; 99(5): 365-73, http://www.hubmed.org/display.cgi?uids=17076689. 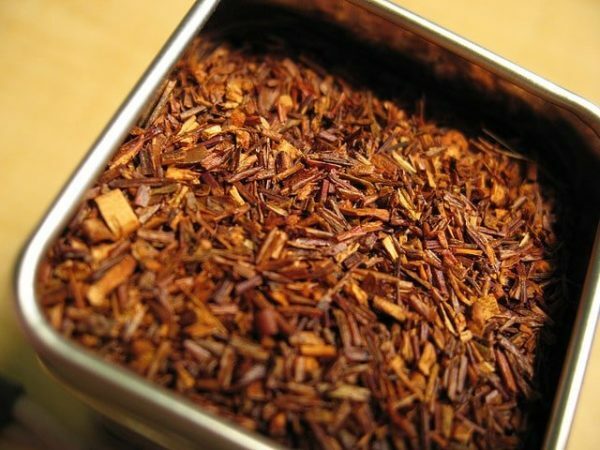 “The Many Health Benefits of Rooibos Tea,” Inhuman Experiment, April 4, 2010, http://inhumanexperiment.blogspot.com/2010/04/many-health-benefits-of-rooibos-tea.html.